Silica gel in Tyvec bags 5 gram. The most commonly used desiccant products are the silica gel desiccant. Silica gel in Tyvec bags is often found in foods and pharmaceutical products. Available in quantities of 100, 1000 or 2000 pieces. Silica gel in Tyvec bags. Available in quantities of 100, 1.000 or 2000 pieces of each 5 gram. The most commonly used desiccant products are the silica gel desiccant. Silica gel in Tyvec bags is often found in foods and pharmaceutical products.Our silica gel is free of dimethyl fumarate (DMF). Silica gel bags can reduce the relative humidity from 90% RH to 40% RH. At room temperature the best results are obtained. 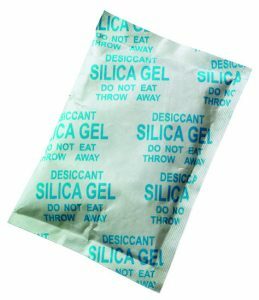 But also at temperatures of up to 220 ° F (105 ° C), silica gel is able to effectively absorb moisture. Due to the large selection of pore sizes, silica gel offers the possibility of using not only water, but also other compounds, e.g. Alcohol, ammonia, aromatic compounds and olefins.